UCSC elephant seal researchers caught the attention of Comedy Central's Stephen Colbert, and a seal named after the comedian highlighted the February 5 episode of his show, the Colbert Report. The episode will be rebroadcast tonight (Friday, February 6) at 8:30 p.m. on Comedy Central. The researchers from Tagging of Pacific Predators (TOPP) named a couple of the animals they've been tracking after Colbert and fellow Comedy Central anchor Jon Stewart, calling them Stelephant Colbert and Jon Sealwart. They also gave them Facebook pages and funny blogs. The goal was to have fun, but also to engage the public in marine science and spread the word about the information and data they were gathering from the high-tech tracking devices they attached to the seals. The story of Stelephant Colbert and Jon Sealwart — along with other seals named by students at local elementary schools — was promoted by UC Santa Cruz in late January, as the seals hit their annual mating and molting hotspot, Año Nuevo State Natural Reserve. The Santa Cruz Sentinel featured the story, followed by Associated Press; it subsequently appeared in newspapers such as USA Today, the Orange County Register, and the Fresno Bee. It also spread virally among Colbert and Stewart fans, making it onto the home page of Colbert's site, Colbert Nation, and on the online news segment of Stewart's site, the Daily Show with Jon Stewart. Researcher Samantha Simmons described the lab's work with elephant seals in an NBC Nightly News story about the new oceanography features on Google Earth. 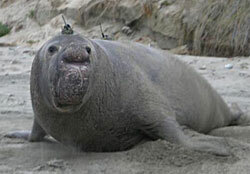 (TOPP) program, which has a site devoted to Elephant Seal Homecoming Days.